Sunday October 28th 1894 It was a fine morning and we went to church. We went over home for dinner and stayed a little while. We were caught in the rain on the way home. It was a rainy evening. Will did not feel well and went to bed early. 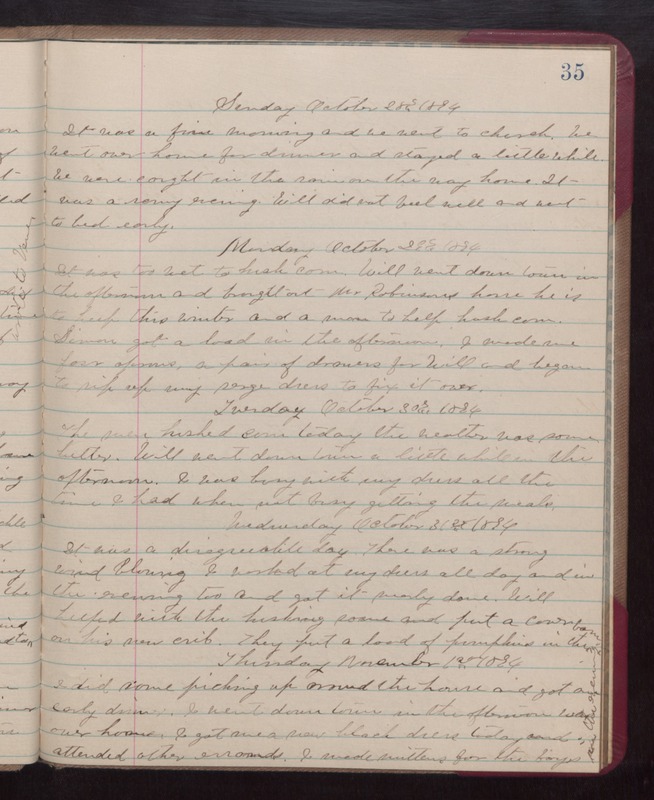 Monday October 29th 1894 It was too wet to husk corn. Will went done town in the afternoon and brought out Mr Robinsons horse he is to keep this winter and a man to help husk corn. Simon got a load in the afternoon. I made me four aprons, a pair of drawers for Will and began to rip up my serge dress to fix it over. Wednesday October 31st 1894 It was a disagreeable day. There was a strong wind blowing. I worked at my dress all day and in the evening too and got it nearly done. Will helped with the husking some and put a cover on his new crib. They put a load of pumpkins in the barn Thursday November 1st 1894 I did some picking up around the house and got an early dinner. I went down town in the afternoon was over home. I got me a new black dress today and attended other errands. I made mittens for the boys [the following text is written verticlaly in the right margin of the above entry] in the evening.